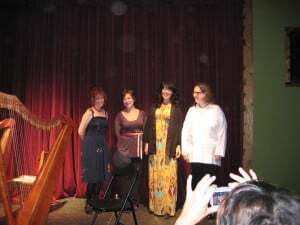 Beginner harp class at IMA, in Wells BC! 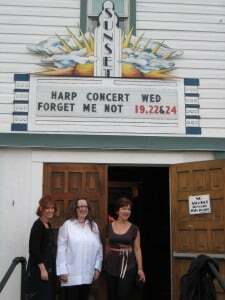 Just back from a wonderful week of harp teaching and playing in the mountains of BC, near Quesnel and Barkerville (yes, right in the middle of all the forest fires!) I have to say that it WAS a bit smokey, but we still managed to have a lot of fun! I was working with a class of total beginners, 8 wonderful women most of whom had never touched a harp before. 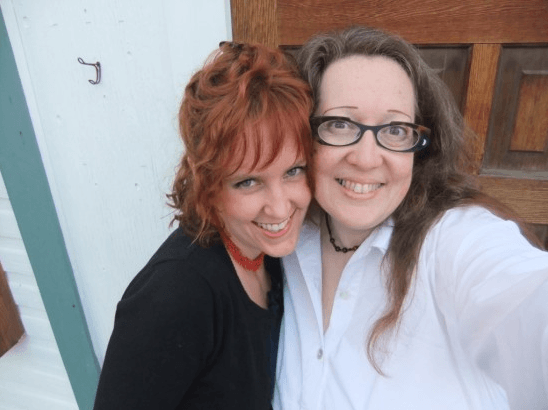 I love teaching beginners – everything is new and exciting for them, and I get to relive those feelings and remember what it’s like to be just starting your musical journey with the harp. Sometimes because I play and teach harp as my job, I lose touch with how magical and special the instrument really is. So it can be really rejuvenating and joyful to work with beginners who are keen and open to the wonder of the experience! We spent a lot of time celebrating all that we accomplished together – but I must say, they really did learn a lot! In just five days, these novices learned how to tune their harps, play intervals of 2nds and 3rds (broken AND solid!) triads and chords – understanding a bit of theory along the way – scales, both crossing over and under – AND, between the eight of them, they learned to play 5 tunes! I thought that was great.